While strength training is important to boost your metabolism so you burn more calories at rest, if you want to lose weight you also need cardio to Weight Loss. 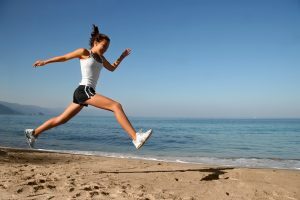 But if you’re not a bonafide cardio-junkie, the prospect of getting in solid cardio workouts each week can be daunting. Plus, you might not even know what the best cardio to lose weight technically is. The intimidation or lack of knowledge can result in losing interest in your cardio instead of losing pounds. Never fear! We’re here to give you a refresher on why cardio matters and then offer up seven surprising cardio workouts for weight loss that you’ll actually WANT to do! They’re a lot more fun (and more simple) than you might think. Ready to get your cardio on? Let’s go! Your heart is a muscle just like any other; to keep it healthy and strong it has to be worked! By getting your heart rate up consistently you’ll keep your heart strong and decrease your risk of heart disease and other problematic conditions. To improve overall cardiovascular health, the American Heart Association recommends a minimum of 150 minutes per week of moderate aerobic exercise, or 75 minutes of vigorous exercise. Cardiovascular exercise causes your brain to release endorphins, the feel-good chemicals responsible for balancing your mood and keeping depressive thoughts at bay. Many people cite beginning an exercise regimen as one step they’ve taken to help their overall mental health. Even a brisk walk can noticeably alter your attitude. Unless you are jogging through smog, the notion that you’re harming your immune system by getting in cardiovascular exercise outdoors is nonsense. On the contrary, cardio exercise in most environments makes your immune system stronger, helping you to reduce your body’s risk of bacterial infection and prevent disease. Cardiovascular exercise improves your blood circulation, which helps your body rid itself of toxins better and keeps you healthy. Poor circulation long-term can lead to problems such as heart attack or stroke, but keeping your circulation functioning properly can help keep these problems from occurring. And yes—cardio workouts help you lose weight like none other! If you start a new cardio regimen, you can see results quickly. Yes, you need strength training to maintain a healthy metabolism, but if you’re pushing yourself to a moderate to high intensity, you’ll burn calories and fat effectively during each and every cardio workout.